Mona Lisa LaPierre’s parents give her little notice that she’ll be spending the summer after graduation in a remote cabin with her curmudgeonly grandfather. Mona must learn who she is in the face of family secrets and her dual Native American heritage. When Mona’s parents announce they’ll be heading to Russia to study bears, Mona is shocked to learn she’ll be spending the time with her granfather in remote New England woods. She is forced to miss graduation and the chance to get her crush, Beetle, to notice her before they part. 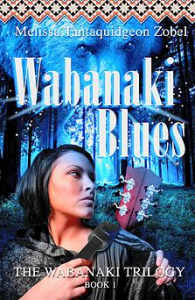 Mona, the child of both Mohegan and Abenaki tribes, has a passion for blues. This passion and the voice of her grandmother Bilki keep her grounded as she goes on a journey to learn the truth about a young woman’s disappearance and in reality, about herself. Zobel, being Native American herself, really paid tribute to her heritage. Instead of watering down Native traditions and stories, they took forefront in this novel. Zobel shares her traditions and writes them with such reverence and respect. I REALLY wanted to like this book. Unfortunately, too many story lines and crossing details made it hard to keep the different parts of the story straight. It’s a genuine coming of age story told in an uncoventional way, which I appreciate. It just became very complex in a way that wasn’t able to keep me engaged. Complex in the name of suspense is fantastic. This just fell short of that for me. Robin Gwaro is the Young Adult and Women’s Literature Editor at Bookgateway.com. She currently spends her days wrangling her 8 year old science nerd and 5 month old busy body.